A vehicular destruction game, out now. Developer Three Fields Entertainment was founded by a couple of former Criterion Games developers, and true to that, the company's first two titles are chock-full of action, explosions and, er, golf. Following on from Dangerous Golf and Lethal VR is the more familiar Danger Zone, which released yesterday. It's pretty much Burnout's celebrated Crash Mode turned into a standalone game. There's no racing, and no open world. Instead you'll find 20 different car crash scenarios, and online leaderboards so you can compare your scores with your Steam friends/Steam enemies/total strangers. 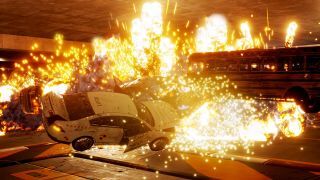 The destruction doesn't look quite as impressive as in the Burnout games, while the entire thing is seemingly set in an underground 'simulation'—but hey, indie. "Powered by Unreal Engine," Three Fields says, "Danger Zone combines real physical crashes with explosive gameplay. Shunt vehicles into oncoming traffic, take down trailers to shed their payloads and use your explosive 'Smashbreaker' to move your vehicle around. The more explosions you cause, the bigger your score". You may now insert your Archer 'Danger Zone' memes in the comments.